This is a guide book for those looking to build or commission a lead generation website. Lead generation websites are needed by companies looking for customers interested in buying or using their services. A lead generation website is much more than choosing a content management system, hiring a web designer and adding pretty pictures and words. If you want leads from your website you need to master psychology, research, buying traffic, copywriting, web design, development, conversion rate optimisation, marketing automation and analytics. You are building an engine of revenue and you need the right tools and people to do this. Building a lead generation website : Download complete guide. For example, let’s say you pay Google Adwords or Facebook Ads £3 per click. Divide the £3 cost per click by, for example, a 3% website conversion rate to get your cost per click and write that number down. You can find your website conversion rate from a previous advertising campaign or use your Google Analytics website conversion. 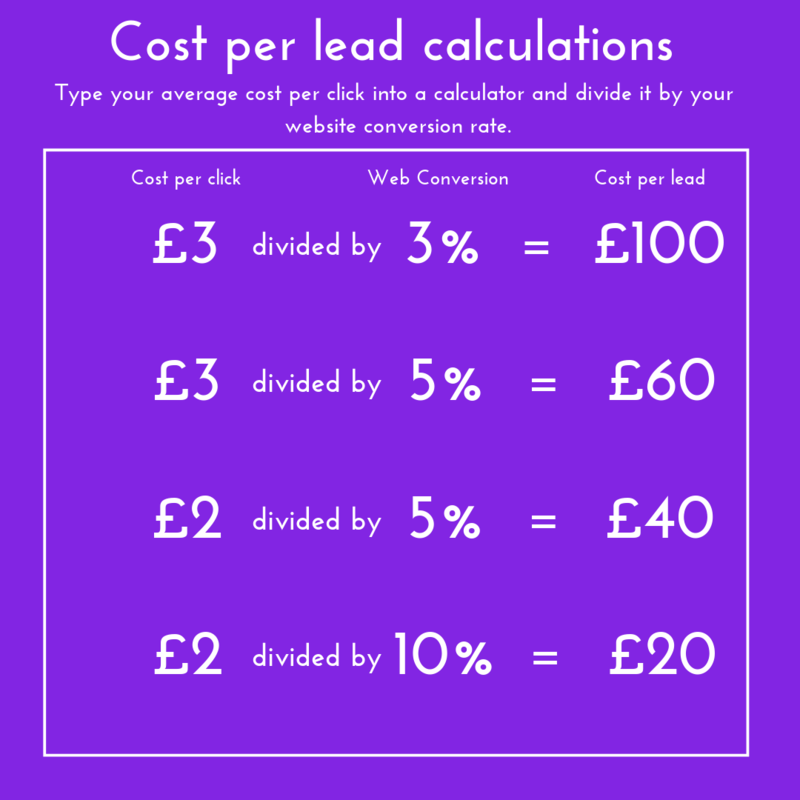 Step 3 : Now divide your cost per click by your lead conversion rate. Your lead conversion rate is the number of leads you generate divided by the number of leads who become customers. 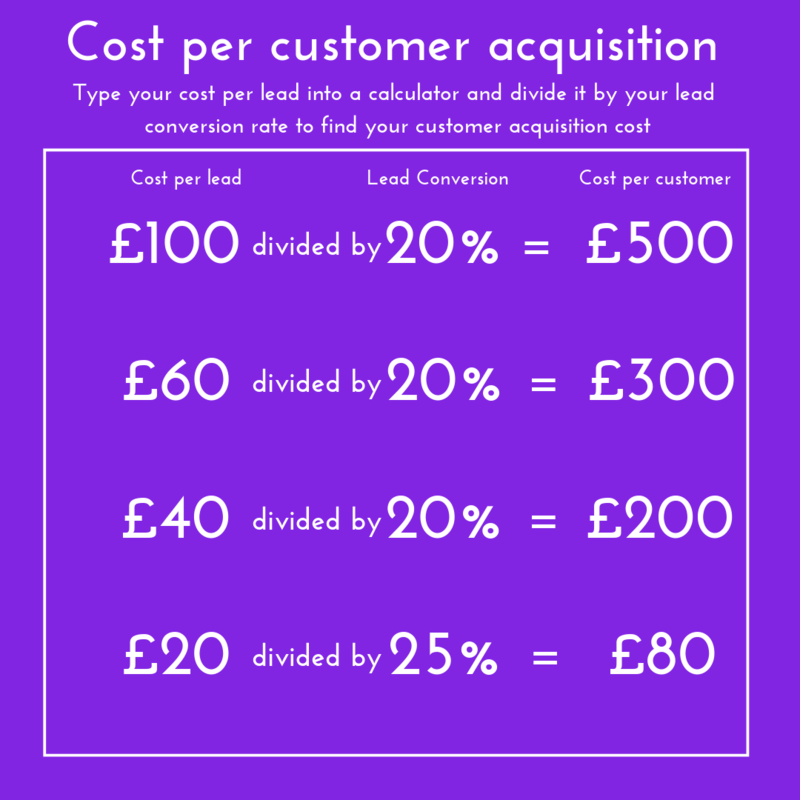 The cost per customer acquisition cost is £500 in this example. 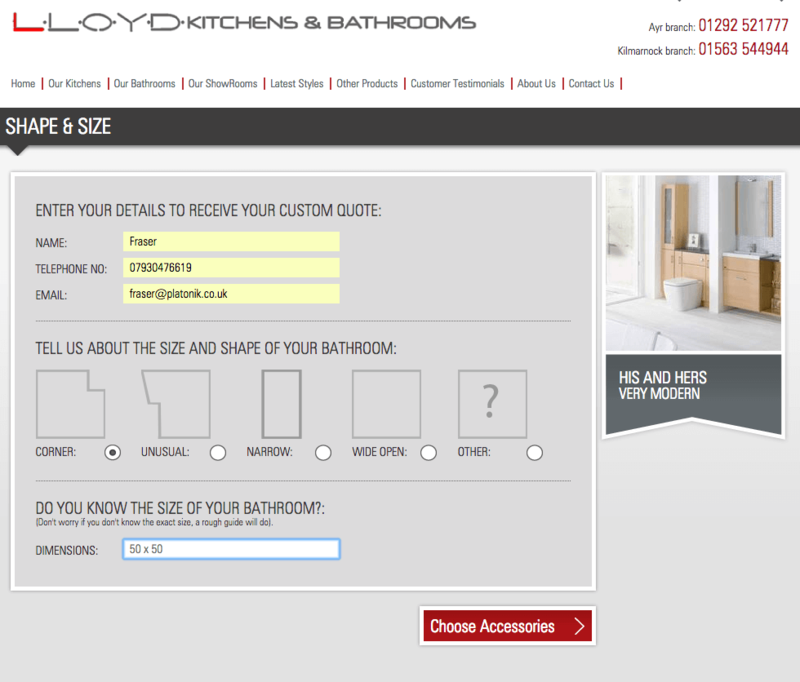 The first example shows a cost per lead at £100 and a cost per customer at £500. 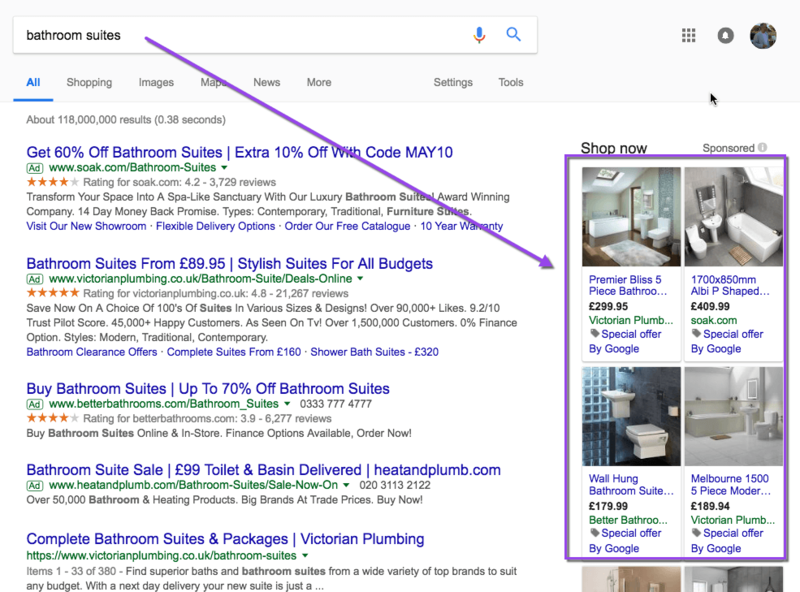 With the other examples, you can see how a lower cost per click, a higher website conversion rate and a higher lead conversion rate can dramatically reduce your customer acquisition costs. Use these examples to see the effect on sales leads if you improve the traffic or website conversion. Look at the 3 examples above. They all generate the same quantity of sales leads each month but have different traffic levels and website conversions. Then look below how the number of sales leads increases 400% (from 50 to 250 leads) when you increase your website conversion from 2% to 10%. Download Complete Guide to Building a Lead Generation Website : Download complete guide. How to budget for a lead generation website (from your price and margin). If you are currently selling your services you should already know your average price and margin. So let me use an example to help you estimate how to budget for a lead generation website. Using the metrics in the example above, Ben sells a service for £5000 and his margin is £2500 (after costs), then £100 would be his cost per lead and £500 the cost per sale. The lead and sales cost is paid out from the sales income;the same way material costs are deducted from income. However if you charge for a £30 service, then the cost of these leads and sales are not financially viable. The reason for building or commission a website is to grow your business. Therefore you need a goal to aim for. 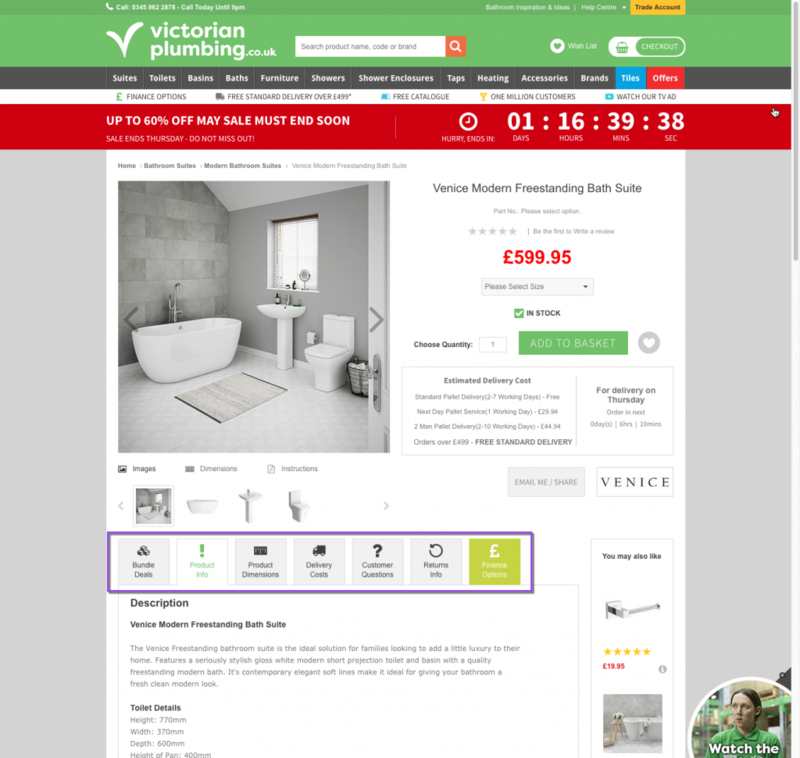 Ben wants to install 4 additional bathroom suites per month at a retail cost of £4999. So using the above example, Ben should budget for 4 sales times £500 per sale; in other words budget for £2000 per month. If his sales goal is 8 sales per month; then he should budget for 8 sales x £500 cost per sale ie: £4000 per month. I am only estimating a budget at the moment but this process enables you to understand that investment is required in order to reach the goal you established. How to visualise the sales process or funnel of a lead generation website. The aim of a lead generation website is to achieve an enquiry of interest in your services. Ben wants to acquire leads in as few steps as possible. Use this calculator to estimate the website traffic you need based on the current enquiries you convert and a good website to lead enquiry rate. Traffic – Ben pays for or earns traffic to his website. Page – the pages will list services he offers and explain what he offers, % will drop off. Enquiry or phone call – on the web page will be a call to action or incentive to telephone Ben’s number or complete an enquiry form, % will enquire. Form – the form will ask for some basic information. Nurture and education – the sale won’t happen straight away so Ben needs to cultivate this enquiry over time, % will buy. Series of conversation – Ben will have a series of email, phone and in person conversations before reaching an agreement. Sale – a contract and/or deposit is signed is made to start the work. Before you can get sales leads you need to research your prospects, competitors and traffic sources. Many business owners looking to commission a website assume designing a home page, a list of their services, an about us page and a contact page is enough to generate sales enquiries. But these business owners underestimate the strength of their competitors online and highly educated consumers will do extensive research before committing to a purchase. You need to discover if there is enough of the right traffic available that you can drive to your website. This is similar to the due diligence a high street retailer would do in assessing the passing traffic and footfall of a potential new retail store location. From my estimate and the metrics above, Ben needs around 1300 visits per month to reach his monthly leads and sales goal. Ben needs to find people who are interested in his type of services; ie: bathroom suites, bathroom refurbishment and bathroom redesigns. You can do website traffic estimations with a free prospect and keyword research tool. Install Keywords Everywhere on your Chrome browser. 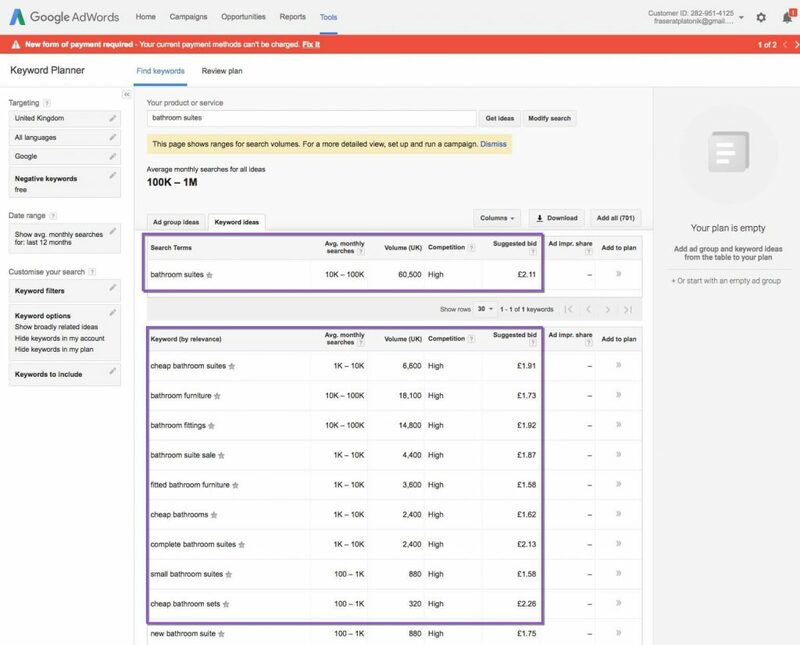 Notice the search volume and cost per click under the search query you typed. Now scroll to the foot of this search query and look at related searches. 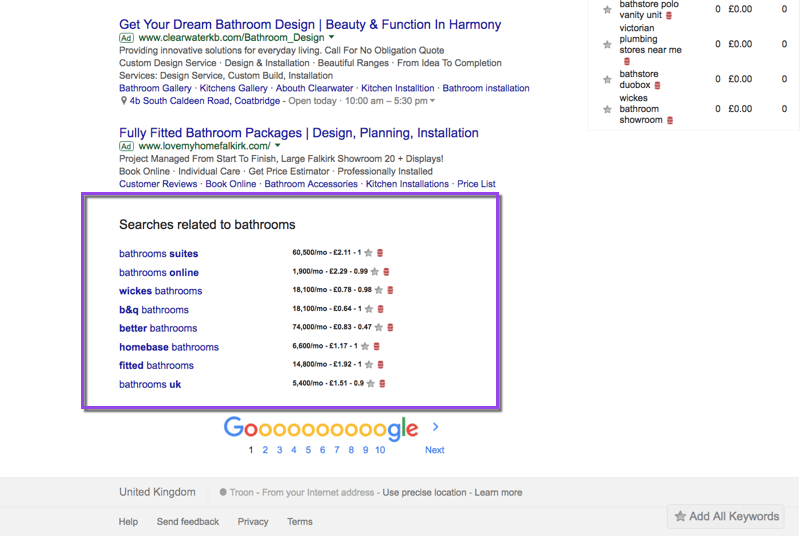 “bathrooms suites” has 60,500 searches and CPC £2.11. Bear in mind these estimates are national search volume for the UK, Ben is located in Scotland; the northern part of the UK with around 10% of the population. Now, notice the details of the search results. Retailers are selling units at £299, £409, £179, £189 and so. 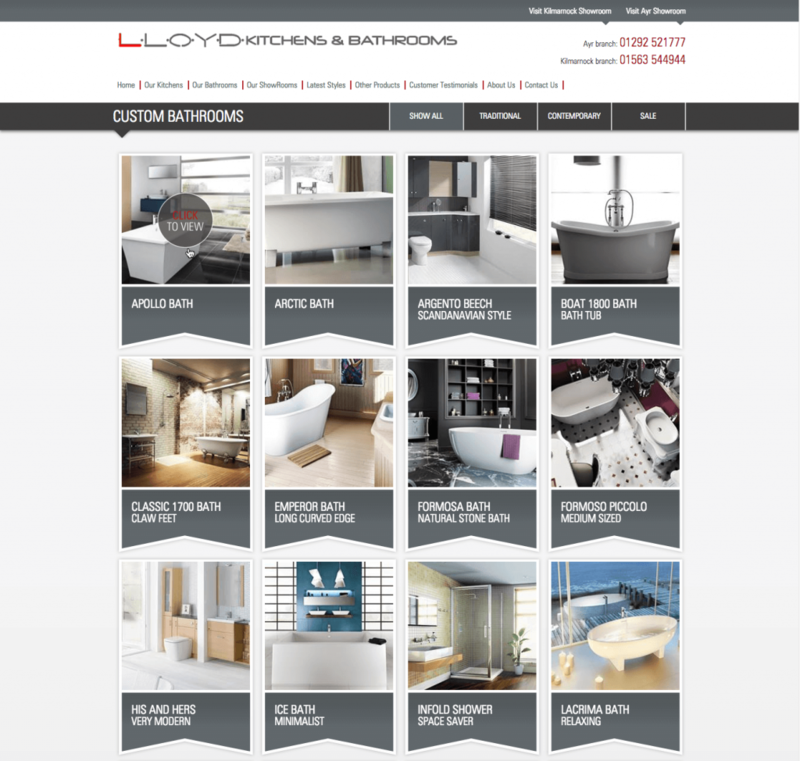 Ben wants to sell his bathroom suites plus extra products plus installation and fitting for £4999. There’s a huge gap between in price between what is offered in the adverts and what Ben’s service costs. That’s a product and price expectation level. 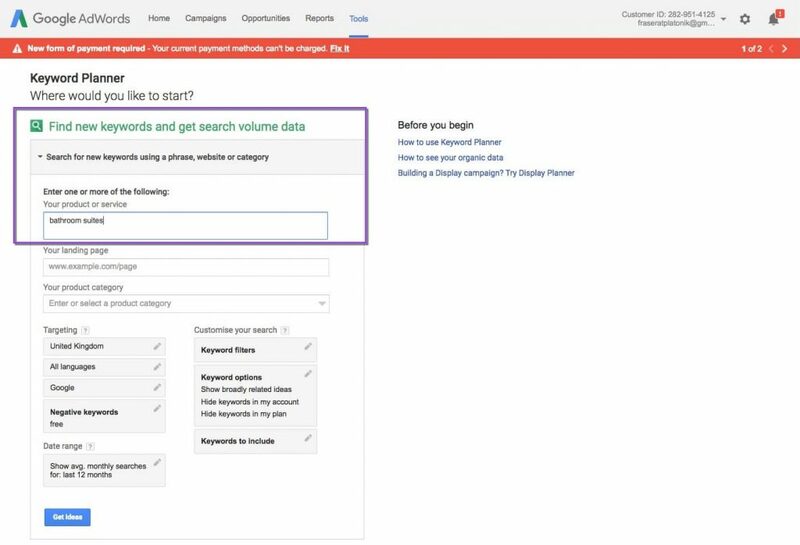 I recommend using paid for keyword research tools to estimate search volume, click volume and the strength of the competition. This is the type of information that Google and free research tools do not provide. Subscribe or log into Ahrefs. 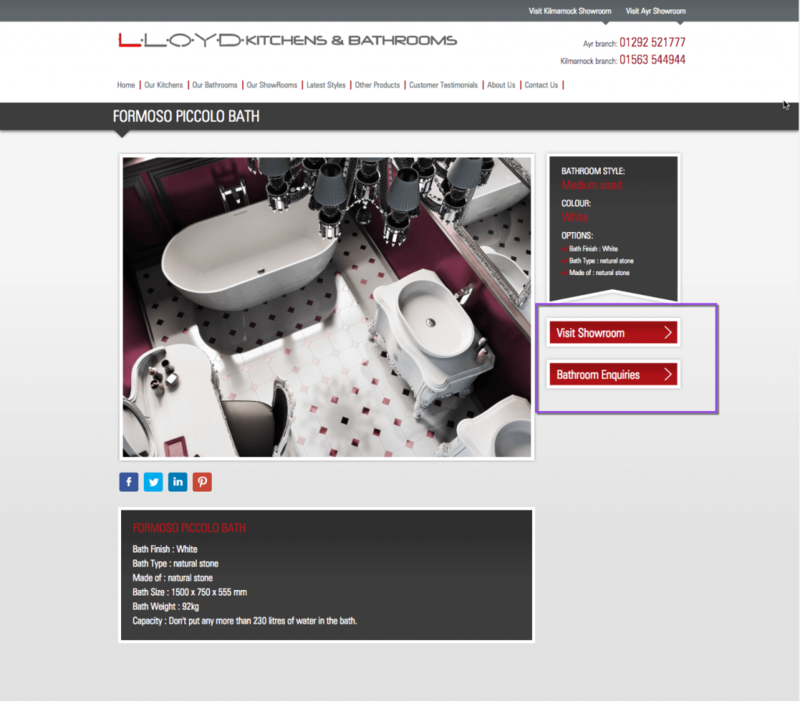 Click Keyword explorer and enter a search query such as bathroom suites. 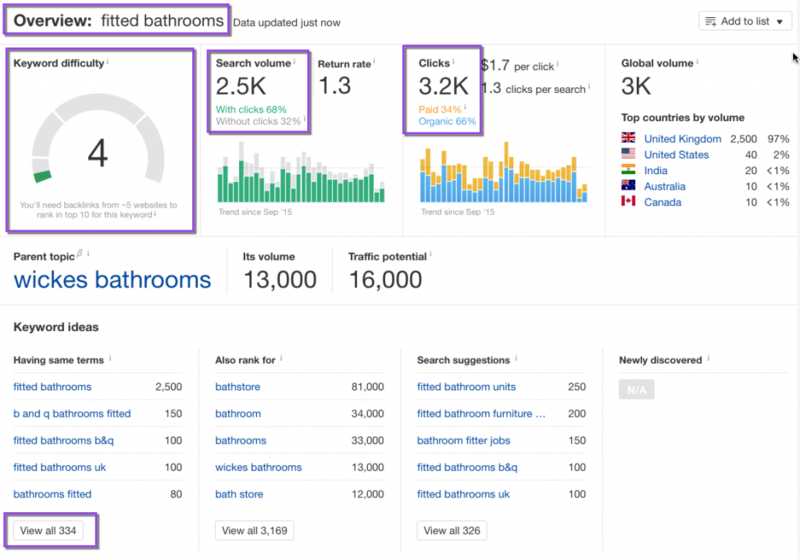 The tool delivers 36,000 searches per month for bathroom suites. The keyword difficulty of 16; this means around 16 links to your page are required for a top 10 ranking. There are 47,000 clicks to the top pages. Of which 51% of those click come from organic clicks and 49% from paid clicks. 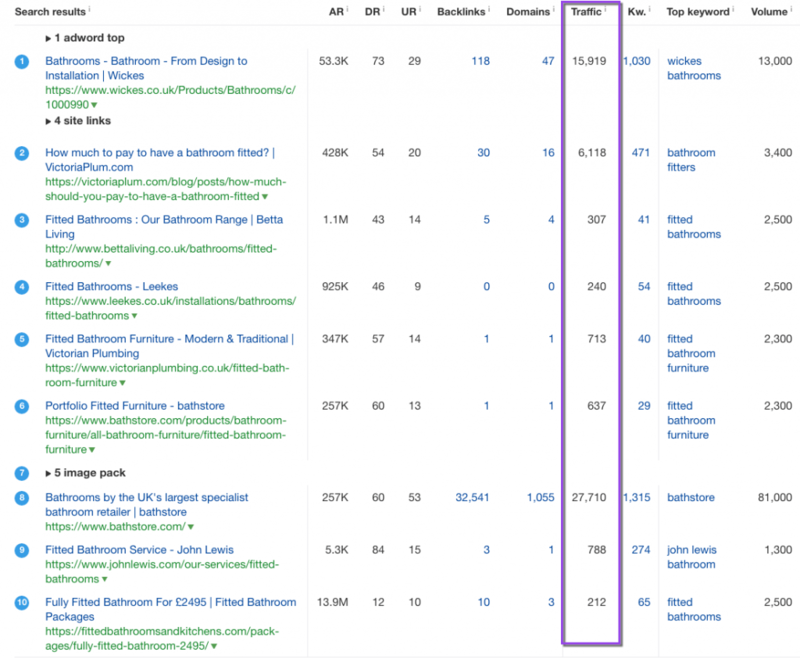 As you can see from the screenshot, there are lots of other related keywords people search for that are similar to “bathroom suites”. For a new website, it would be difficult to rank in the top 10 where the keyword difficulty is 16. The already ranked websites have stronger domains built with many other websites linking to them. The domain strength and links to their page are very strong ranking factors. As I mentioned there are thousands of related keywords that may be easier for Ben to rank his web pages for. Still using my paid keyword research tool I look for more service page opportunities. 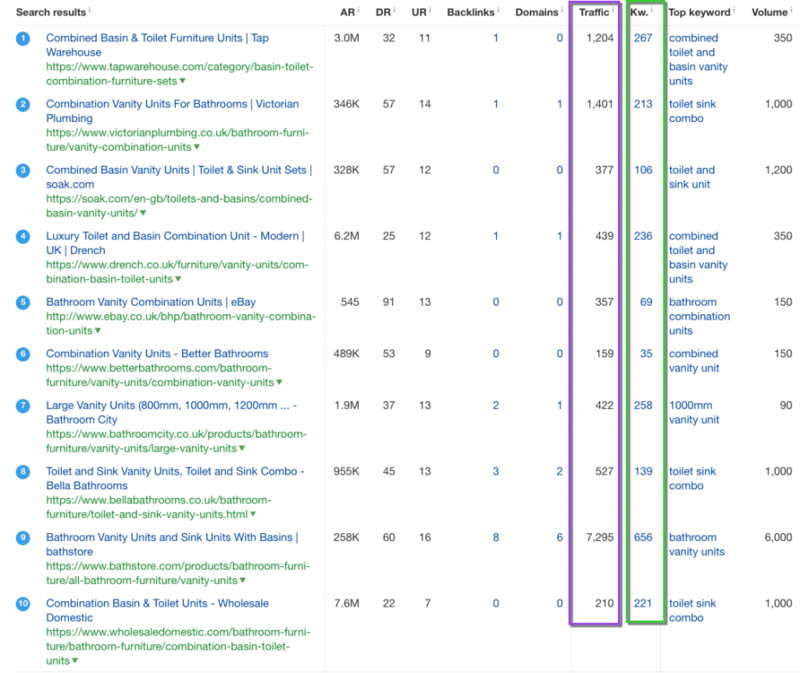 I use search volume and keyword difficulty as my 2 keyword selection criteria. These are 8 potential service pages that I could create for Ben. Let me investigate the first search opportunity; victorian bathrooms. 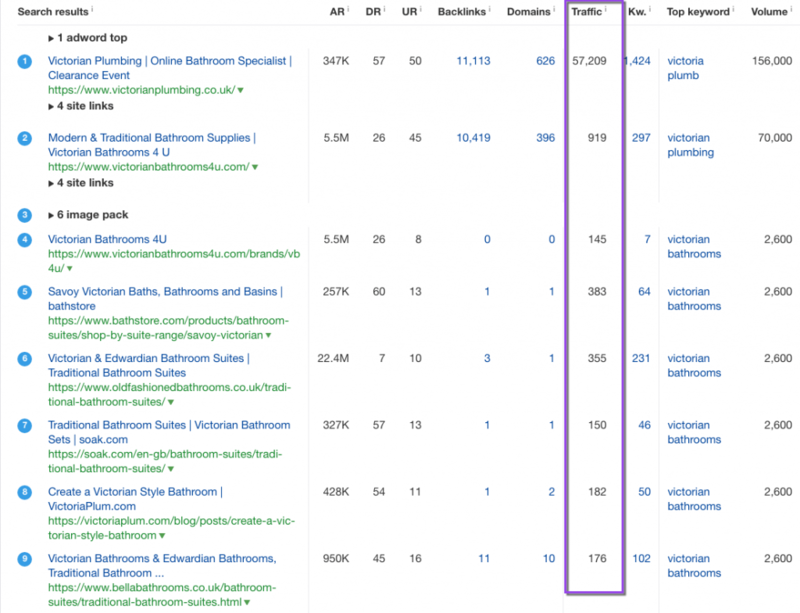 Looking at this screenshot of the search query “victorian bathrooms” I discovered the following information. Then I look at the clicks or traffic the pages in the top 10 search result get for this search query. Count up the numbers in the traffic column and you’ll get the average top ranking page gets 328 clicks per month. This is a fairly easy to rank ‘topic” to rank for (keyword difficulty of 1) since 5 of the top 10 results have either 0.1,2 links to their page. If you recall Ben’s website goal was 1300 visits/clicks per month, and so far I’ve found a search opportunity that could deliver 328 clicks. Let’s look at another topic from the above list of opportunities I found. Now I look at the traffic the pages in the top 10 search results receive. Look at the traffic column in the screenshot below. The top 10 pages, on average, get 566 visits per month. Look at the KW column highlighted in green above. 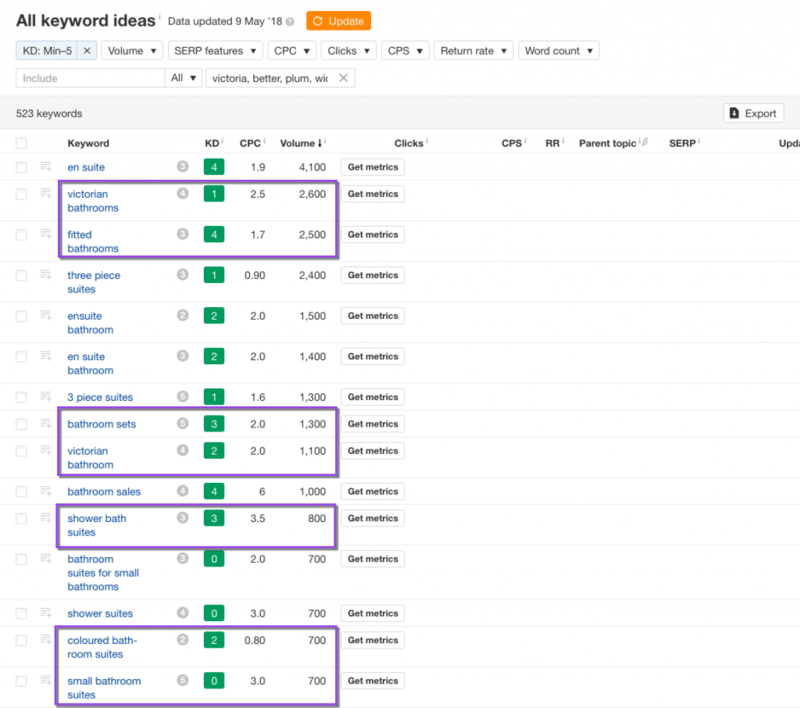 Notice that these pages all rank for hundreds of keywords. Notice in the domains columns that every result except one page has one or less links to their page. I have identified the search and click volume for 2 pages that could bring Ben 894 visits to his website each month. I still need to find a further 404 clicks per month. 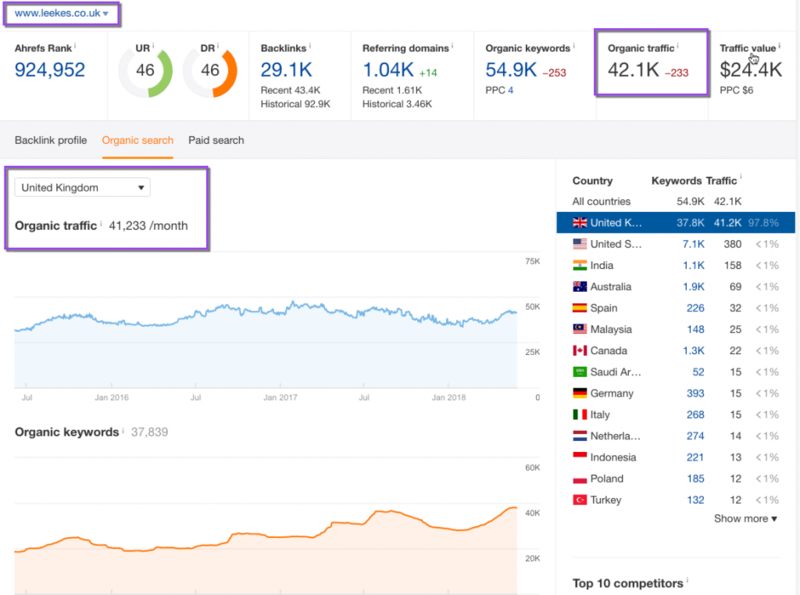 How to do competitor analysis for a lead generation website. 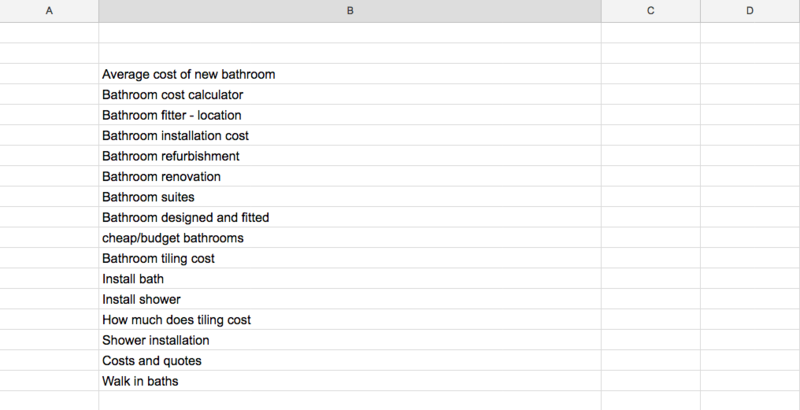 Let me circle back and look at a search topic I identified earlier; fitted bathrooms. 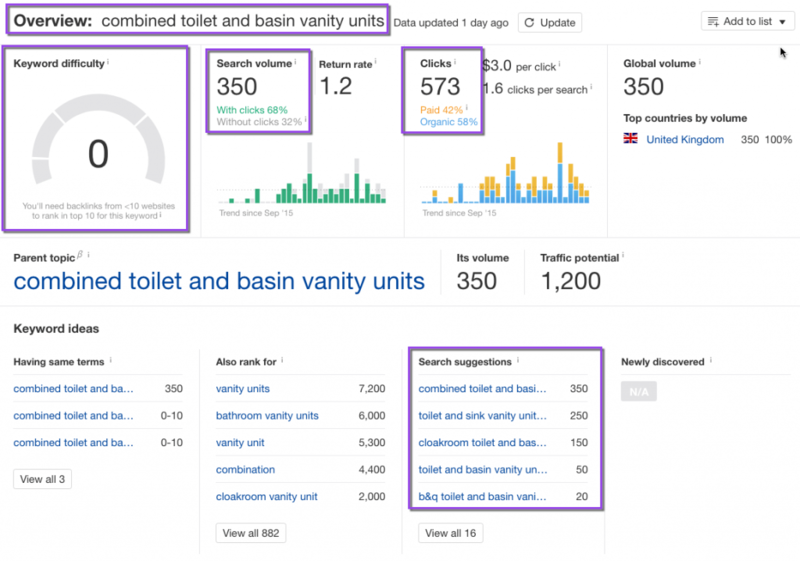 Here’s the key metrics for the search query “fitted bathrooms. Look at the traffic to the top pages for this search query. On average the top ranked pages get 538 clicks per month to their page (omitted the 1st and 10th result). 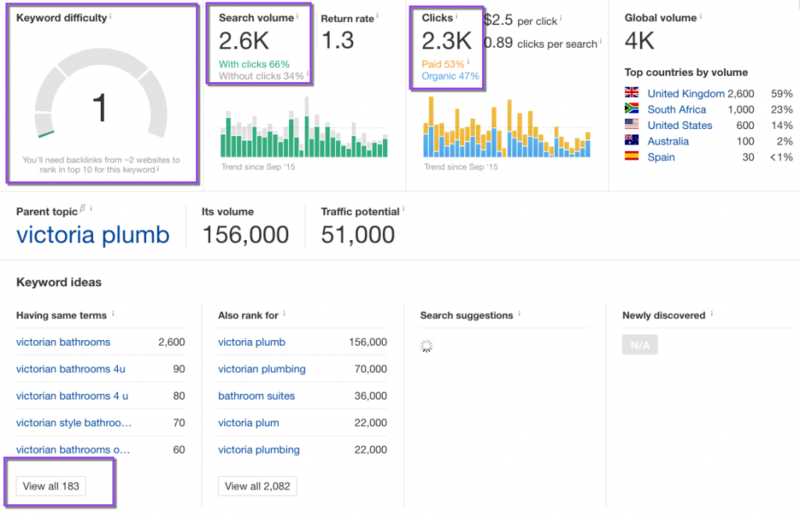 So with this brief analysis of 3 service topics, I’ve found enough organic search traffic to help Ben achieve his traffic goal. Look at weakest competitors (DR) and see where else they get their traffic from. I picked the Leekes website that has the 2nd weakest domain in the top 10 results. Total traffic to their website from organic search is 42,500 organic visits per month. 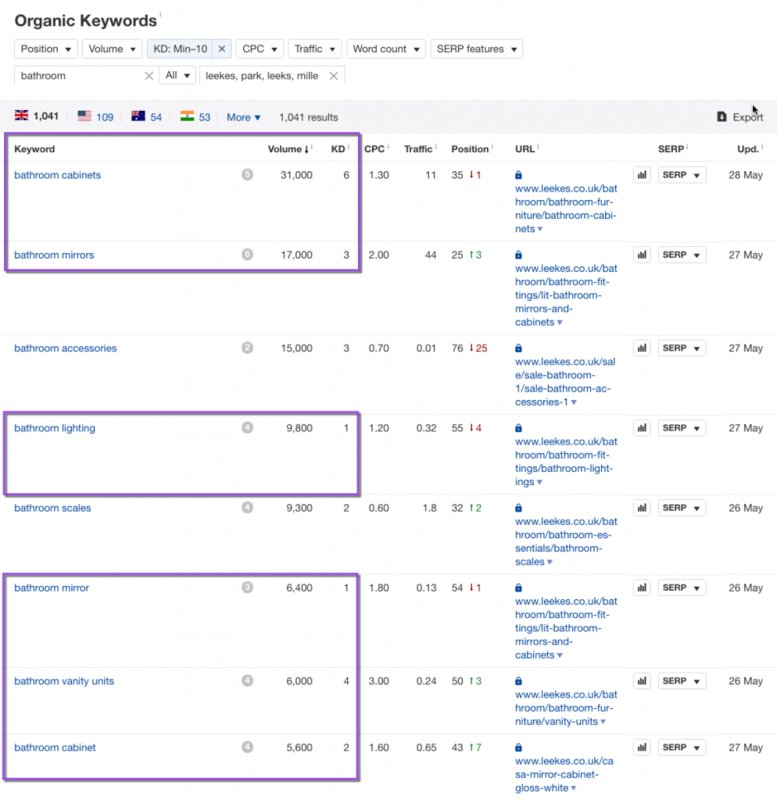 Look at some of their best organic keywords and pages they rank in Google for. Let me analyse the search term “Bathroom mirrors”. Of the 25,000 clicks to the top pages, 40% of those clicks come from paid results and 60% from organic search results. 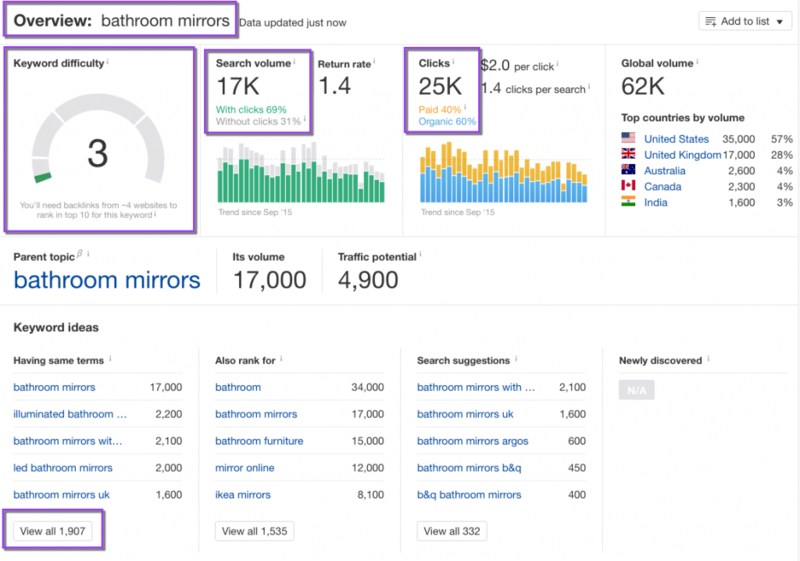 Average top page in Google for “bathroom mirrors” gets 2638 visits per month. If Ben built useful, in depth and relevant pages around the topics I have researched for he would have vastly more traffic than he requires. Why did I show you these related keyword opportunities ? Whilst people are searching for mirrors may not be considering a new bathroom right now but they could be the right type of person. They are definitely considering ideas for their bathroom. Ever gone into to a shop looking for a new pair of shoes and ended up looking at their suits and jackets ? 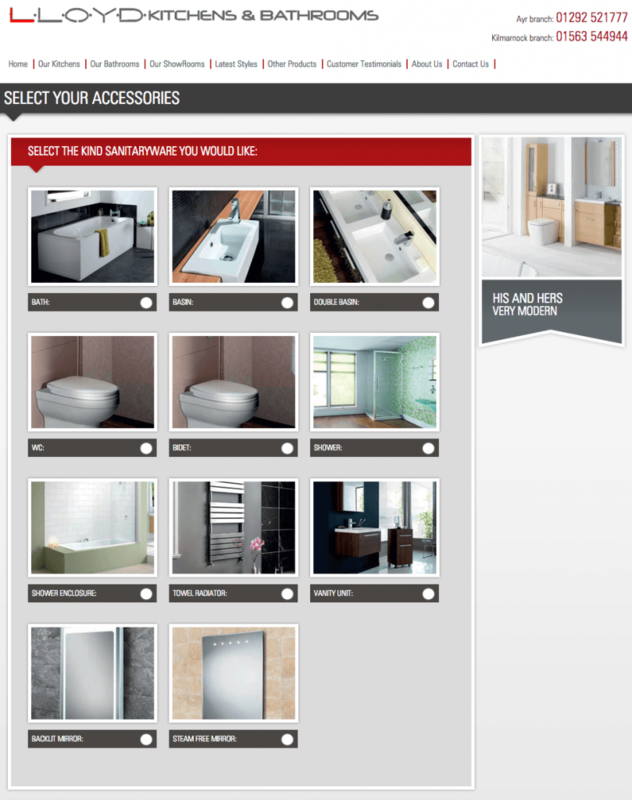 If Ben can attract people looking at bathroom related products he’s got a shot at showcasing his bathroom suites. It takes time to get organic traffic from Google to a new website. Therefore we must identify relevant advertising channels like Facebook and Google that can deliver traffic quickly to Ben’s website. An industry study by Ahrefs and Brian Dean showed that 1890 words was the average word count for a page in top 10 of Google. 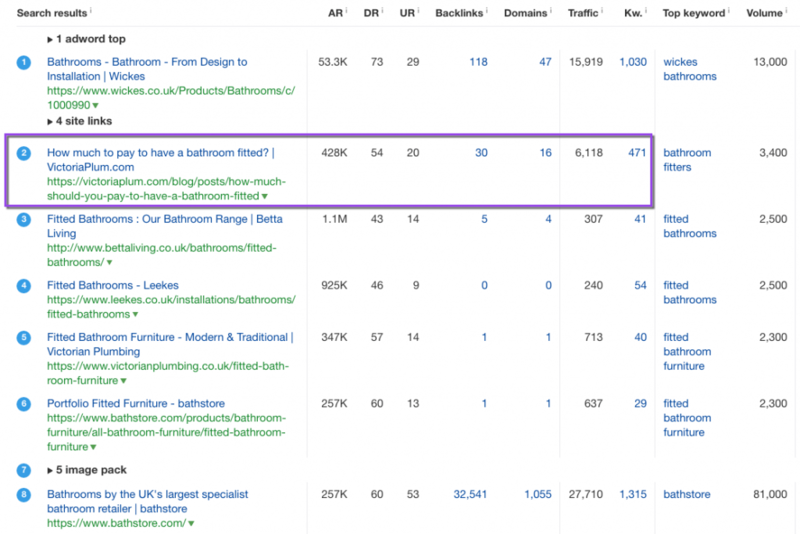 So I analysed the top 10 websites that rank for fitted bathrooms. Average page word count is 1946. 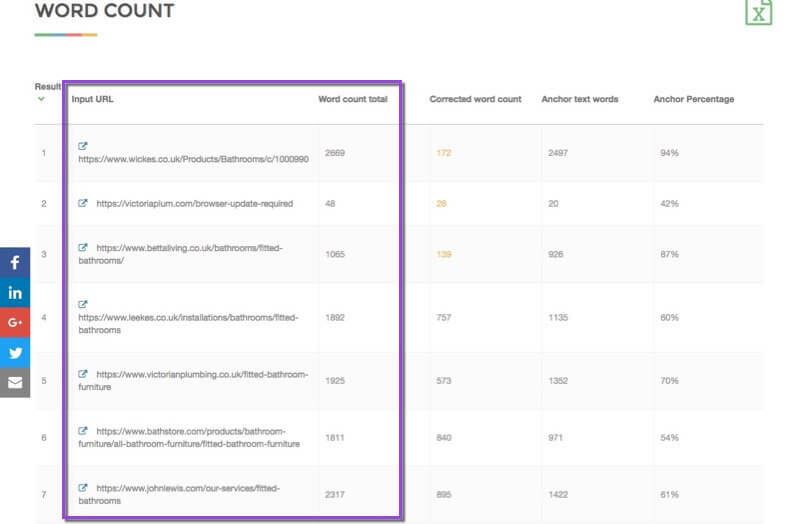 Then I analysed the page in top 10 that ranks for the most keywords. Notice in the highlighted row that this page ranks for 471 keywords. So I exported those keywords into a spreadsheet and grouped the keywords together to see what kind of content Ben needs to create to rank for this main keyword. These keywords are the questions people that type into Google. The role of a web page is answer those questions. They want an answer or a solution to their problem. How to do advertising research for a lead generation website. 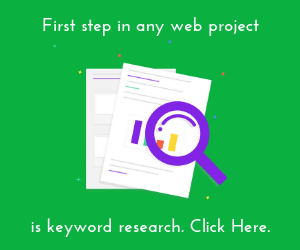 Doing advertising research will help identify strategies to drive traffic to Ben’s website quickly but also to identify the resources his website will need. Set up an advert with a daily budget and send people to Ben’s web page. This is obviously a very simple example but gives you an estimate of the cost per click. I can do similar research for Facebook Advertising. 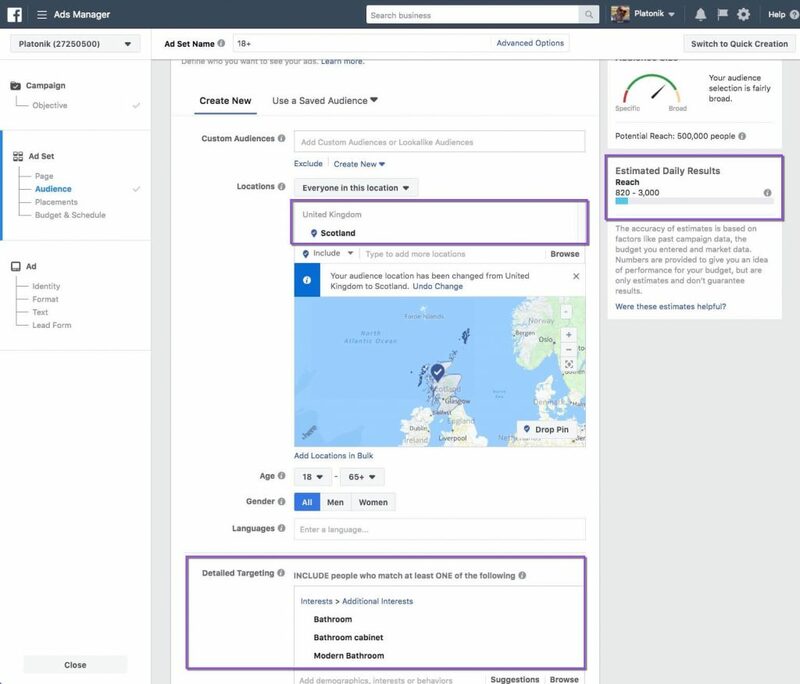 I set a daily budget of £20 or £140 a week and Facebook proposed a maximum cost of £2 for one lead. Now I know with greater confidence that I can drive or earn enough traffic to Ben’s website to help him reach his goal. I know what people are searching for, I know I can rank his pages and I know there’s enough people he can afford to target through advertising within his budget. 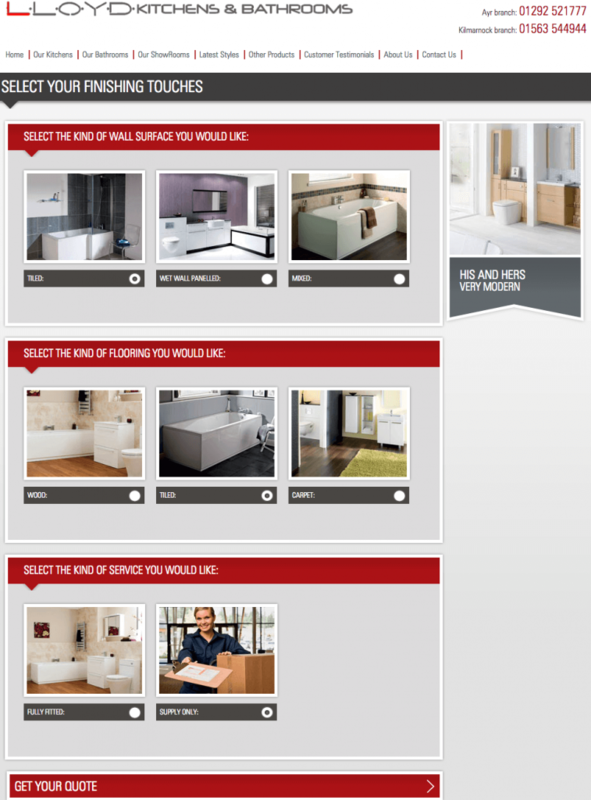 The home page of a website tells people who you are, what you do and directs users towards your services and products. In addition the home page will include a design that resonates with users and include accreditation the builds user trust in your company. Websites typically have navigation bars at the top and bottom of every web page. 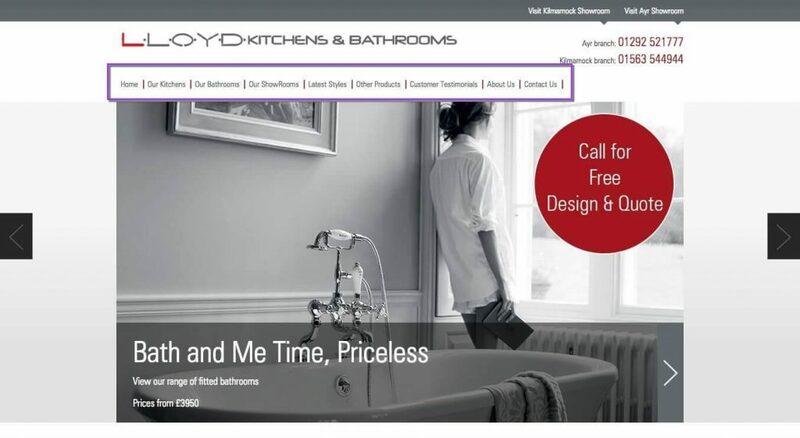 The top navigation displays links to key pages such as services, resources and a contact page. 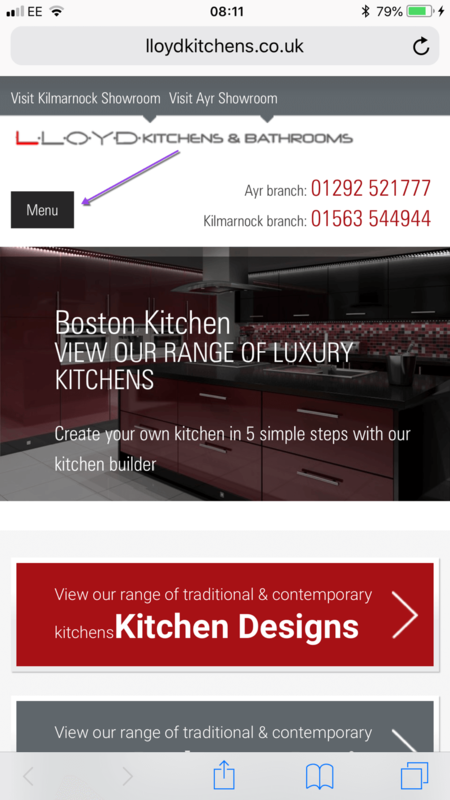 With websites having to respond to mobile and tablet devices, the navigation on smaller devices has been reduced to a hamburger menu. As I identified in my earlier research, there are different types of services that Ben can offer that require separate pages. Ideally, the website should group and list all the services on one page and then links through to each individual service page. The service page should be designed to sell your service and prompt people to enquire ie: become a lead. This service page does a great job with it’s prominent link to enquire or visit showroom but the service information lacks. The only issue I have with this page is that there is an add to basket button instead of an enquiry call to action. Blog posts are simply resourceful pages or articles on a website that can attract a lot of traffic to a website and leads if done correctly. They are typically created as non commercial pages for people early sales journey or at the top of the sale funnel. Notice subscribe link at top of navigation. But there’s more powerful and persuasive ways to leverage such blog posts. My best blog post has a 13% visitor to conversion rate; these subscribers are not ready to by but they are ready to be educated. 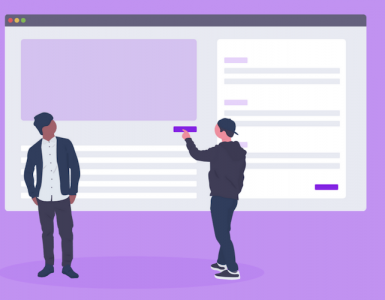 If you start from a user’s mindset and can answer “what’s in it for me” when they are on a web page, then you have a better chance of this user becoming a sales lead. Your web page content should make a user motivated offer, relevant to their needs and your service. For example, the web page you are reading right now is an educational guide to building a lead generation website. The next element to design on a web page is the call to action. Think of a call to action like a green or red sign on traffic lights. They tell users want to do. Green tells the drive to drive and red tells the drive to stop. A lead generation website requires signs or prompts that tell the user what to do during or at the end of a web page. Here are some popular call to action examples on lead generation websites. The call to action on this web page is an offer to download the Guide To Building a Lead Generation Website. Where to place the call to action button or link ? You need to create a lead enquiry form to capture the contact details of the prospects. At a minimum there should be a field to insert their first name, email address and a box to ask what they are interested in. Here’s a very simple enquiry form. Here’s an example of a very detailed enquiry form that has 4 steps to it. Ask too much information and you reduce your enquiry rate. Ask too little and you affect your enquiry to sales conversion rate. 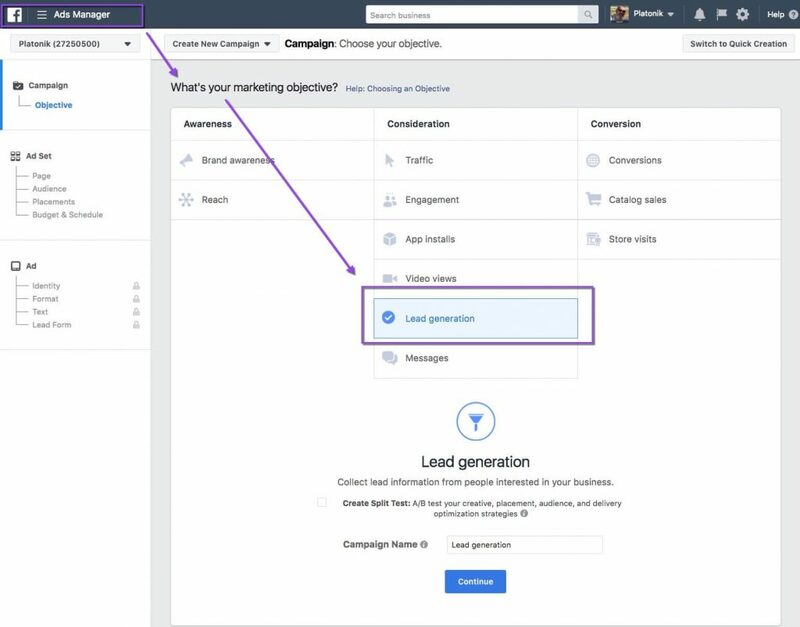 How to turn leads into customers with marketing automation tools. Once the user has completed the website form or acted on the web page offer, the next stage is the follow up. The length of time between a sales lead and a customer varies from short to long depending on the customer, product and industry. A car mechanic gets an enquiry from a car owner and only has to reply with the time they will do the car repair. The restaurant owner may reply once when an enquirer asks about gluten free items on the Christmas menu. Then a second email promoting limited table availability during the festive period turns the enquiry into a customer. A £600 sporting service may take 12-18 months of education and following up to turn a prospect or sales lead into a paying customer. When someone contacts us from my website, we mark the prospect as a sales opportunity in our CRM as a new business opportunity. The user is also added to a marketing list and can be sent a series of emails that educate them about our service. Blog posts contain a bonus offer to download and users who subscribe are also added to a unique marketing list to follow up. We use the WordPress Content Upgrade plugin on other websites to offer users a bonus download in exchange for their email address. The email address of the sales lead is captured and added to GetDrip and given a tag to identify the page they subscribed from. With GetDrip you can schedule a unique workflow to follow up on sales leads. If the lead becomes a customer, you can remove them from a prospect workflow and put them into a customer workflow and schedule completely different customer communication. When you run a lead generation website or campaign you need access to analytical tools. Every website must have Google Analytics installed. You can create and track goals. The goal is the page users land upon once they have completed the enquiry form. 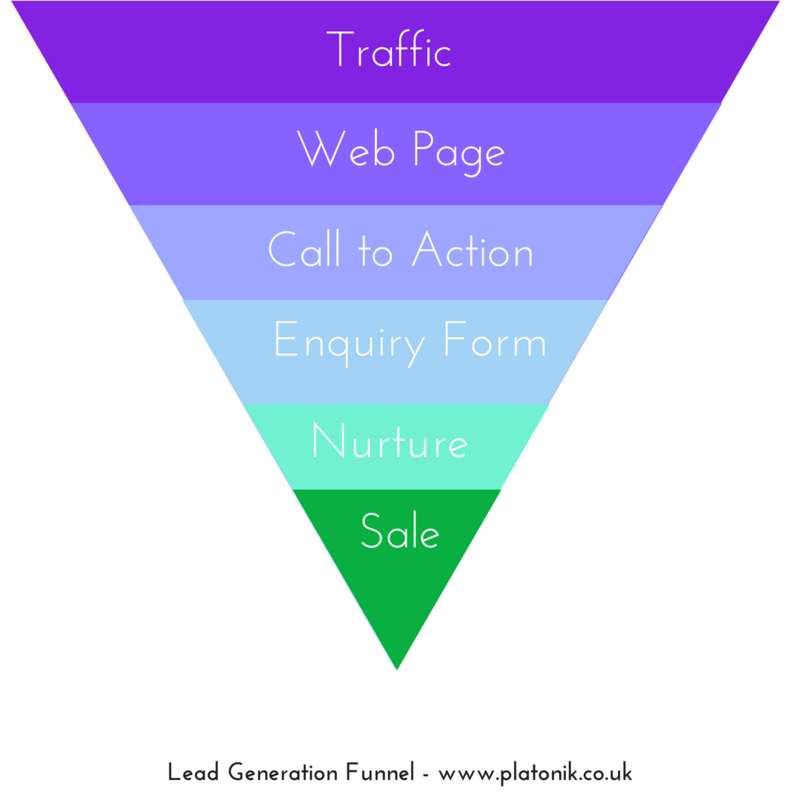 You can also create a funnel to analyse the entry and drop off points in your lead process. Again you create and analyse a sales lead funnel. You can also “record” users on your website to see the pages they visit, where they click and how they interact with your enquiry form. And if you have any problems with your enquiry forms you can use their form analytics to see where visitors drop off or issues they have with the fields on your form. Various analytical tools will tell you traffic to your website, from which source, how many sales leads you get and your sales lead conversion rates; if installed correctly. 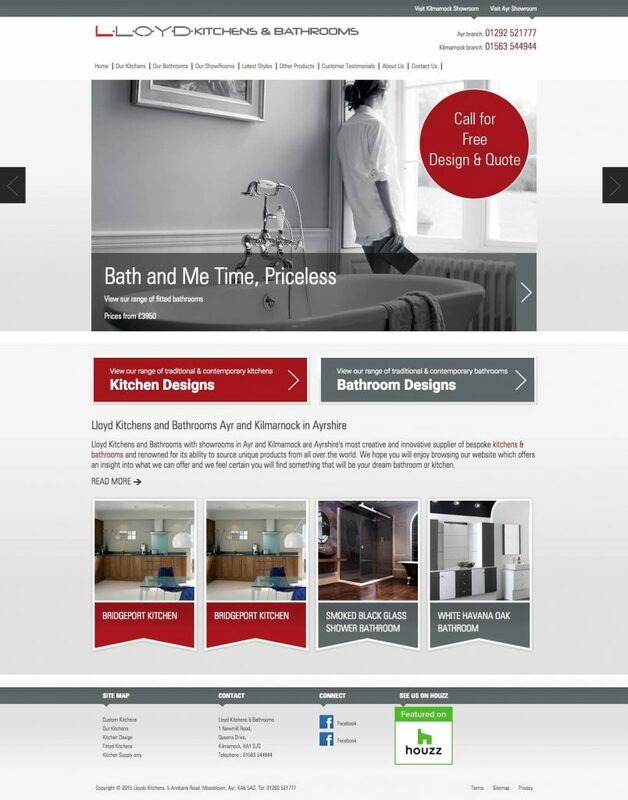 The following are some case studies from lead generation websites and campaigns. 55% (131) of my leads were generated from organic search results in 14 weeks. Of the 131 leads from search, 49 of those leads came from my guide to planning a website structure. 61 leads (25%) of my website leads were generated from social networks. This really surprised me because, I’m the first to admit, I don’t really ‘get’ social media. Let me explain this social channel. Quuu Promote take blog posts and feed them to people who use a tool called Buffer App. The people using Buffer App are looking for interesting content to curate and share on their social media networks. They are looking for other people’s content that re-affirms their beliefs and or makes them look good. As a result, Facebook, Twitter and LinkedIn were the 3 primary channels that have resulted in generating leads from social networks. The social lead generation process I’m going to outline had an inexpensive paid for element to it. You promote influencer content with Quuu Promote. Create account with Quuu Promote and pay Quuu to promote post for 60 days. Create Facebook and Twitter graphic with Canva. I paid for 12 campaigns, Quuu gave me bonuses to promote posts again. You can watch the YouTube video I created outlining how to use Quuu Promote. It’s very simple, but here’s on outline of my process. Your influencer content is generally content aimed at other people in your industry as opposed to your sales or product pages. In my case, my influencer content is all my blog posts; that generally are ‘how to’ guides. Provided you have a spare $40, go to Quuu Promote and sign up. I think they offer a free 14 day trial to test out their service. You will require Facebook and Twitter graphics as part of promoting your posts with Quuu; unless you have great looking open graph formatted images already. Use Canva to create your graphics as they have pre designed templates in the correct image dimensions for sharing on Facebook and Twitter. Keep your words to a minimum and ensure the word font size is big and bold. Select your url to promote. Upload the graphics your create. Choose a channel to promote your post to. In the time frame from 01 September to 15 December I generated 61 leads from social media this way. Nothing particularly special but results nevertheless. 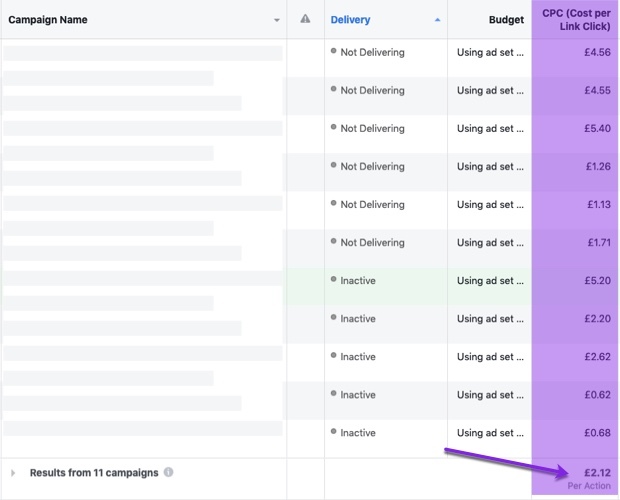 That’s a 2.6% conversion of social sessions to leads. I’m happy with a conversion rate like this. I looked at a previous time frame; April to September and I generated 100 leads from social channels; 45% of my total leads. Cost of $40 to promote each post; in total $480. Canva costs $12.95 per month. In terms of time spent, I would estimate about 15 to 20 minutes to create the graphics and run the promote. Since I already accounted for content creation time in the SEO section, we won’t count that cost here. I turned nearly 20% of existing email subscribers into sales leads in 14 weeks. In the introduction, I outlined that people who subscribed to my blog posts are classified as subscribers. They do not become a lead until they visit certain pages, open emails or click links in emails I send. Drip has a feature called Lead Scoring. I customize my CRM to award 10 points to people who visited my services pages, 5 points to subscribers who visited by cost page and 1 point if they opened or clicked a link in emails I send once they have subscribed. When a person opts in, they are a subscriber, not yet a lead. So, I built up my own lead scoring system. I have sent 22 email marketing campaigns since the 1st of September to pages on my website not indexed on Google that contain helpful content. Ultimately my goal is to turn a sales lead into a paid for customer. But my email marketing efforts also help to educate subscribers and build up their lead scores. Additionally, Drip has rules that can be triggered and send emails when subscribers visit certain pages; which increases the number of emails I sent. For example, if a subscriber visits my service page they are awarded 10 points and an email is triggered if they do not purchase from the page. To calculate my sales leads, I simply run a subscriber report. I filter all subscribers who subscribed on or after 01 September with a lead score of 10 or more. The result is 42 leads. With a total of 239 subscribers in this time frame, I have converted 18% of subscribers into sales leads. Drip costs $49 per month for up to 2500 subscribers. Then I have to factor in the time to set up and run all 11 emails marketing campaigns and their follow ups. Email campaigns are not time consuming to run with Drip; 11 times 30 minutes equals around 6 hours in 14 weeks. Quizzes are a method of reaching people early or at the top of the sales funnel. I tried using quizzes as a way to engage people and get them into my sales funnel. I’ve only used 2 quizzes to test this tactic out. Sign up to Try Interact. Integrate the quiz with Drip. Tag users based on the answers they score. Create a workflow to send users their quiz score. Promote the quiz through email marketing, Quuu Promote and social media. By filtering my subscribers with the quiz answer tags and then filtering those with a certain lead score I am able to calculate subscribers and leads. 50 subscribers and 14 leads during the time frame; although the quiz was only promoted in one email campaign and one Quuu Promote campaign. I introduced a client, who sells to consumers, the power of quizzes and he has generated a huge number of subscribers using paid for Facebook adverts. Try Interact is relatively inexpensive at $29 per month. There’s a whole host of reasons why your website doesn’t generate enough website enquiries. Here are some solutions I’ve used to increasing my website enquiries. 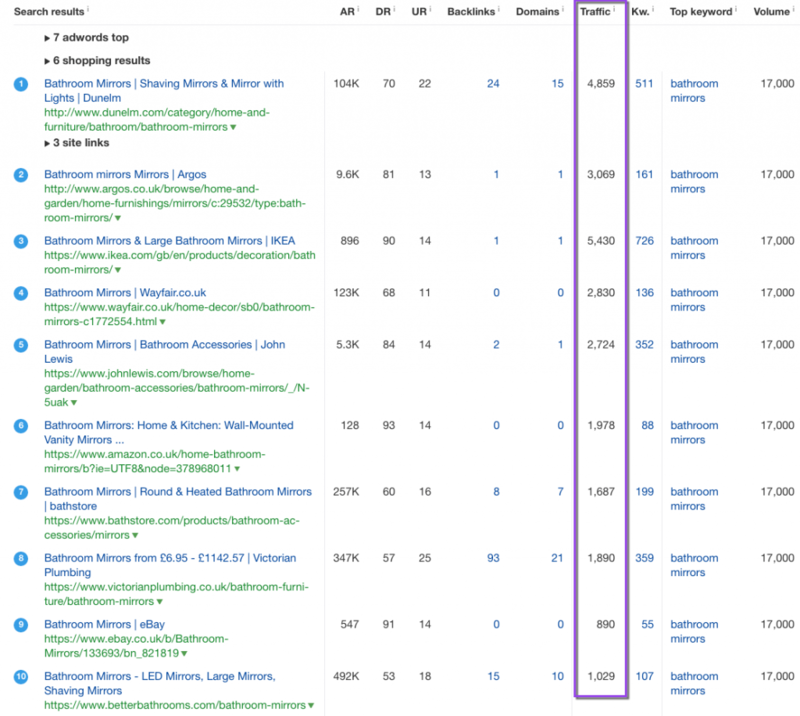 Doing keyword research helps earn traffic and enquiries. 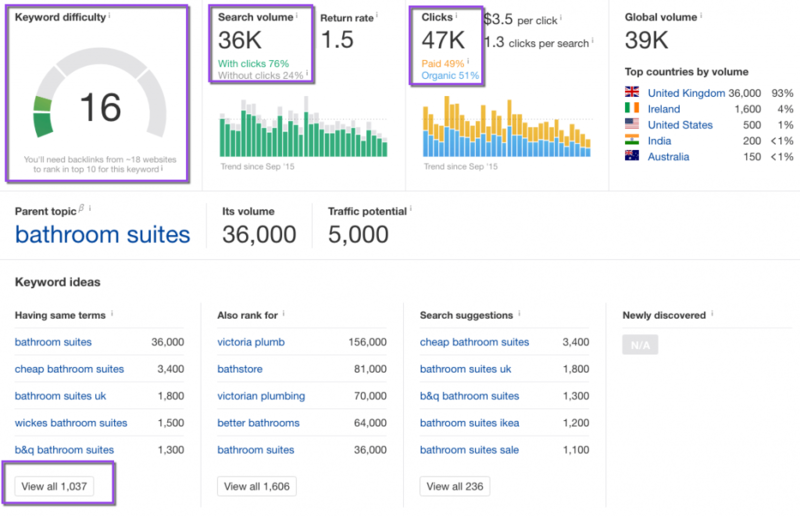 Creating “how to” guides from keyword research is the route to more traffic. Creating list post guides from keyword research is the easiest content to create and drive traffic. More industry links boost some page rankings, thus traffic and enquiries. 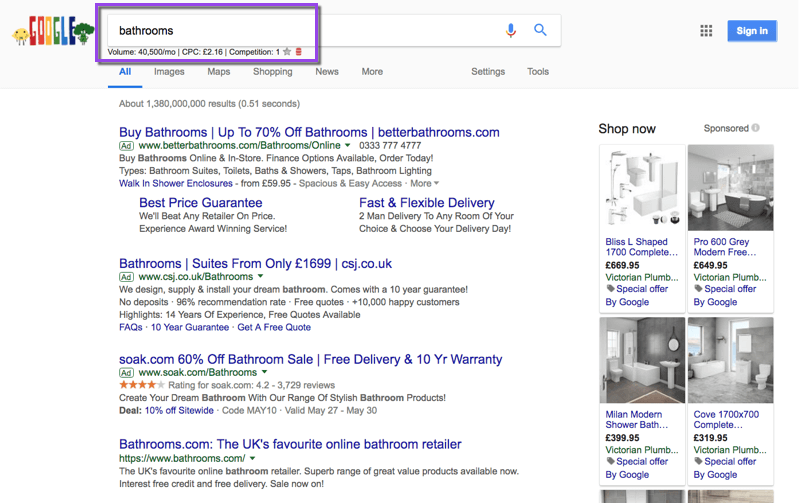 Identifying low converting pages and changing the offer and call to action. Adding a sidebar link to other pages helped reduce the website bounce rate and users stayed on my website longer. Reduced the number of fields on enquiry pages will increase enquiries (worked for client websites too). 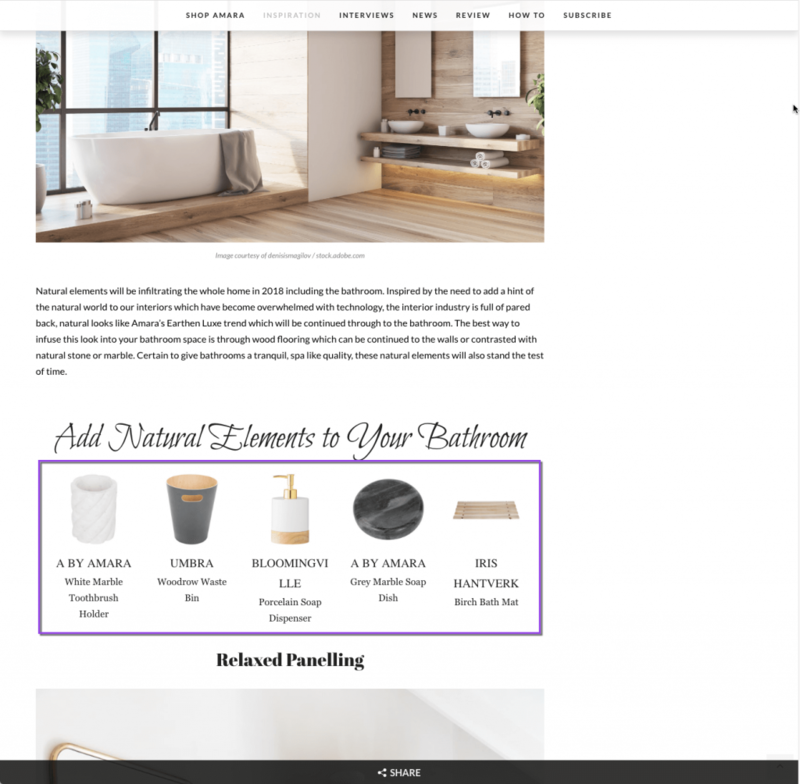 Make unique offers on each page with a unique call to action. Maybe people visiting don’t want to enquire. Make words easier to read on mobile devices with larger font sizes. Removing or improving pages with out of date content. Retarget website visitors who did not enquiry with Google or Facebook remarketing campaigns. 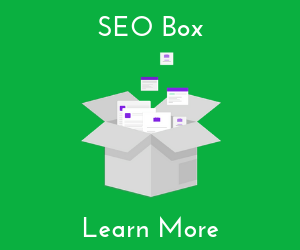 New pages and topics created are opportunities to earn more traffic from Google. My website would rank higher if I had even more links from industry websites. If I ranked higher for some pages, I’d get more traffic. I convert around 3% of website traffic into enquiries, so more links = more traffic = more enquiries. My top page has lots of traffic but a low conversion rates so perhaps my offer on this page is very weak. 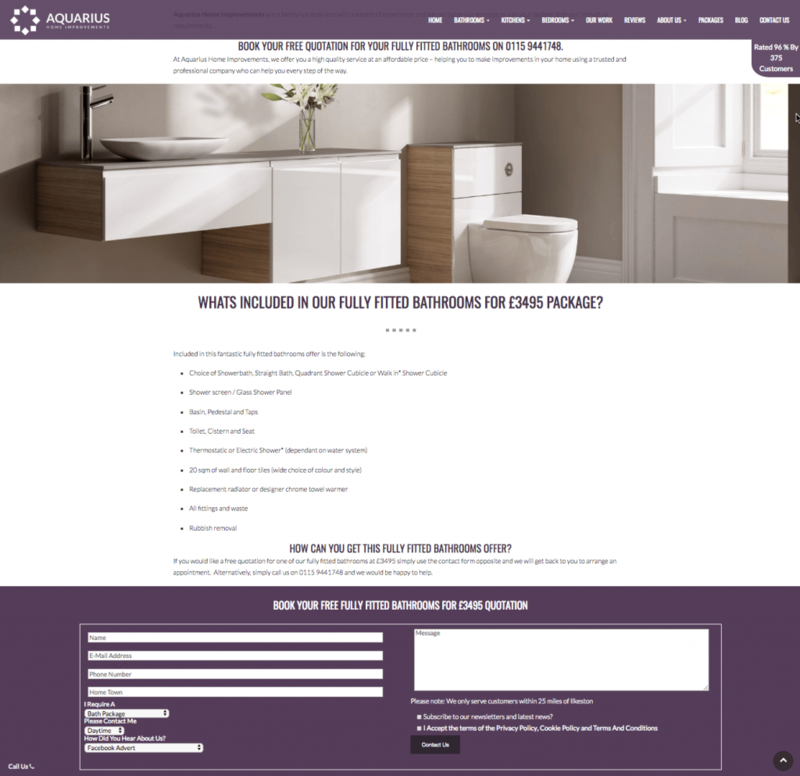 Improving or changing the offer could result in more website enquiries. A lot of website visitors leave my website after looking at just one page. So I decided to add right sidebar links to my pages to reduce my bounce rate and keep more people reading more pages. I make offers to people on my website; this is a stage before an enquiry. I create guides that people can download in exchange for their email address. This adds them to my mailing list and over time I send a series of email to educate them and turn them into enquiries and customers. Some of my pages are out of date, irrelevant and don’t get any traffic. So I either remove them or update them. I made my body fonts larger so the words are easier to read; especially on mobile phones. I started re-targeting people who’ve previously visited my website with Facebook advertising. It takes people time to know and trust you so just because they didn’t enquire first time they visited you doesn’t mean they are not interested in you. Enter your name and email to download the complete guide to building a lead generation website.